Polarcus Limited received its eighth 3D seismic vessel on 21 June 2012 when Polarcus Adira was delivered at Ulstein Verft in Norway. The vessel is the second of two 12-14 streamer Arctic 3D seismic vessels built at the yard, and is the eighth vessel in the Polarcus fleet of the Ulstein SX134 design. 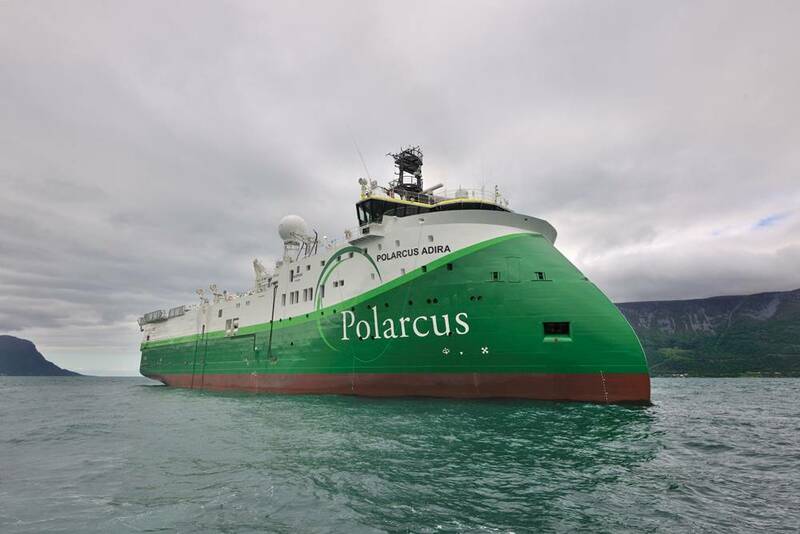 The marine geophysical company Polarcus Limited received its eighth 3D seismic vessel on 21 June 2012 when Polarcus Adira was delivered at Ulstein Verft in Norway. The vessel is the second of two 12-14 streamer Arctic 3D seismic vessels built at the yard, and is the eighth vessel in the Polarcus fleet of the Ulstein SX134 design, characterized by the sleek Ulstein X-bow hull design the shipbuilder has become known for. The sistership Polarcus Amani was delivered by the yard at the end of March. Earlier vessels were built under license by Drydocks World Dubai LLC.. They include Polarcus Nadia (2009), and Polarcus Naila (2010), 12 streamer vessels of type SX124, Polarcus Asima (2010) and Polarcus Alima (2011), 12 streamer vessels of type SX134, Polarcus Samur (2011) and the Russian flag vessel Vyacheslav Tikhonov (2011), 8 streamer vessels of type SX133. The other vessels carry Bahamas flag. All vessels are designed by Ulstein Design and Solutions AS. Following a short shakedown Polarcus Adira will commence operations on charter for TGS-NOPEC Geophysical Company ASA (TGS). Polarcus Limited, registered on the Oslo Stock Exchange, operates a fleet of high performance 3D/4D seismic vessels. Polarcus offers contract seismic surveys and multi-client projects worldwide and employs over 500 professionals. The company's principal office is in Dubai, United Arab Emirates. The hull of Polarcus Adira and Polarcus Amani were built at Kerch Shipyard Zaliv in Ukraine. As is the custom for the ships built by Ulstein Verft shipyard in Ulsteinvik. This was the seventh hull built at the yard. The vessels are equipped with streamer winches, towing points and gun winches. The X-bow hull line design, combined with a redundant diesel-electric propulsion system, ensures good performance with regard to speed and fuel consumption. The overall length of Polarcus Adira, yard number 293, is 92m and the breadth is 21m, which is identical to those of sister vessel Polarcus Amani. Depth to main deck is 9.0 m, design draft is 6.5m and maximum draught 7.5 m.
The deadweight at maximum draught is 4,472dwt. Gross tonnage is 7709GT and net tonnage 2313NT. The hydrodynamic efficiency of the X-BOW, result in good sea-keeping abilities, it also provides a safe and comfortable workplace for the crew both during transit and seismic surveys, as it eliminates slamming. The soft entry in waves also reduces spray and eliminates icing. The vessel is equipped with a helideck (D-value 22.2 m, 12t, UK-CAA CAP-437 suitable for Sikorsky S-61N / S-92) for added safety and to ensure an efficient crew change, and is built according to IMO code of safety for Special Purpose Ships (SPS), enabling it to operate worldwide. The vessel has two workboats, by Westplast, and a Norsafe MOB boat onboard and six life rafts each for 35 persons with dedicated davit. The vessel has diesel-electric propulsion. The main propulsion system comprises two Wärtsilä 9L26 main diesel generators, each 2920ekW at 1000rpm, plus four Wärtsilä 9L20 1710ekW diesel generators, at 1000rpm. The generators are supplied by ABB. The total power is 12,680ekW. There are two propellers of controllable pitch type in nozzles, the shaft line of each driven by two variable speed electric motors through twin in-single out reduction gears type Scana Propulsion ACGTS 1000. All diesel engines have selective catalyst reactor (SCR) units, supplied by H+H Umwelt, to reduce NOx emissions. NO2 emissions are reduced by some 90% to 98%, soot by 20% to 30% and hydrocarbon emissions by 80% to 90%. There are two ABB electric propulsion motors in parallel configuration on each side, each motor 0-2200ekW, 0-1000rpm. The two controllable pitch propellers in nozzles, supplied by Scana Propulsion, each absorb 4400kW at 160rpm and have a diameter of 3700mm. There is an Caterpillar emergency generator with a power of 240ekW. The vessel runs on marine gas oil (MGO) with low sulphur content. The Fuel oil (MDO) capacity is 2030 cu.m. and fresh water capacity 1032 cu.m.. The vessel can also carry ballast water/tech. fresh water 2170 cu.m., lube oil 63 cu.m., and urea for the catalysts reactors 289 cu.m. Towing pull in seismic operation is 82t. Bollard pull exceeds 125t. Polarcus Adira has a maximum speed of 17 knots, at 5.5m draft. There is one 1200kW tunnel thruster forward equipped with a controllable pitch propeller and one 850 kW retractable azimuth thruster forward. There is one tunnel thruster aft, 830 kW, controllable pitch. The vessel is equipped with a roll damping tank system. There are two fresh water generators, each producing 15 cu.m./24h. There are two fuel oil separators, self cleaning type and three lube oil separators. In addition there is one mobile hydraulic oil separator and a USCG approved bilge water separator. A ballast water treatment system is installed. Ulstein Power & Control has delivered the switchboards 690V, 400V and 230V, the emergency switchboard, and the communication and information system type Ulstein COM® to the vessel. 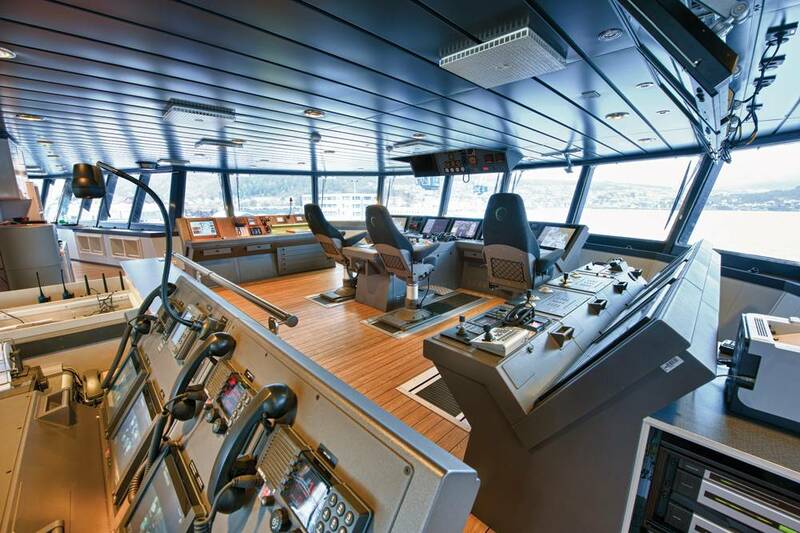 Alse the bridge control and navigation system is of Ulstein delivery. The vessel has a Kongsberg Maritime Dynamic positioning system, DP2 type, and has two DGPS, and a radius reference system. There is preparations for Kongsberg's HiPAP 500 high precision acoustic positioning. The integrated automation system is supplied by Høglund Marine Automation. Polarcus Adira is an Arctic-ready vessel designed and built for operations in Arctic waters carrying the ICE-1A* and Winterized Basic notations from Det Norske Veritas, the classification company of these vessels. Polarcus Adira can operate in first-year ice of up to 1 metre thickness without the assistance of icebreaker. The hull is ice-reinforced and the vessel has de-icing and ice-preventing systems at critical tanks, pipelines and systems, and the propellers, gears and thrusters are dimensioned for withstanding operations in ice. Escape corridors and rescue equipment are also protected against icing during Arctic operations. The hull form is not really icebreaking, why the intention is to do the work in open water. 3D seismic acquisition will only take place in ice-free water. The Arctic qualities of the vessel enables the vessel to relocate through ice to and from the survey area, or remain in icy areas waiting for the ice to clear, increasing the operational window of the vessel. Polarcus’ worldwide service capabilities encompass conventional 3D surveys and sophisticated wide- and multi-azimuth projects, high-density 4D development surveys. Polarcus Adira is a 3D/4D 12-14 streamer seismic research vessel capable of deploying up to 14 Sercel Sentinel solid streamers. The navigation system is ION Orca and the depth positioning system is of type ION DigiBIRD combined with DigiFIN lateral control and DigiRANGE acoustic ranging, supplied by ION Geophysical Corporation. The seismic air gun source is by Bolt Technology 1500-LL/1900-LLXT with dual sources. The source controller is a fully distributed digital gun Seamap GunLink 4000 controller. The seismic operation room is located midship over two decks in close vicinity to the seismic winches in the work area. Seismic dedicated areas include a Seismic operation room, Rack room (Server room), Back deck store, Bird shack, Air gun control room, Technical library, Tape store, Tail buoy workshop, Two battery stores and a Streamer store repair room. There are a number of winch systems fitted with radio remote control. Under an agreement with GX Technology, this global independent data processing company provides the on-board seismic data quality control and when required seismic data processing services on-board Polarcus' vessels, and onshore advanced seismic data processing services at one of its Data Processing Centres. Polarcus Adira is built with a hotel compliment with permanent capacity for 60 persons in 32 single and 14 double cabins. There is a mess room which seats 43, day rooms, internet café, gym and sauna, as well as a hospital, offices and a conference room. There are three crew state cabins, one client state cabin, twenty-eight one-bed cabins, fourteen two-bed cabins. There are also rooms for dry provision, a cooler and freezer room, and laundries. There is a special helicopter reception room. The classification company is Det Norske Veritas. The vessel is designed for environmental friendly operations. The vessel carries the Clean Design notation from DNV. A GREEN PASSPORT is issued. Low noise and vibration levels are recorded in the accommodation and on deck. Class notations are Det Norske Veritas ✠ 1A1, E0, DYNPOS-AUTR, CLEAN DESIGN, COMF-V(3), ICE-1A*, WINTERIZED BASIC, NAUT-AW, HELDK, BWM-T, TMON, SPS. The vessel carries Bahamas flag.